Monarchs are moving down their Central Texas flyway going south for the winter. Most of the Monarchs we see right now are not actually going to make the trip of thousands of miles to the canyons of southern California, and the volcanic highlands of Central Mexico. The Monarchs that winter there are the third or fourth generation of the butterflies that summered in the northern parts of the US. The mystery is that none of the Monarchs returning to their wintering grounds have ever been there before, and they begin their southern journey spurred on and guided by some circadian internal compass. This is just one example of one fascinating butterfly species, but there are many others just as mysterious and interesting as the Monarch. The beauty and complex lives of butterflies are why they capture our imagination. People are elated when surrounded by these fragile creatures that float around like flower petals released upon the wind. When my husband and I visited NY we visited the live butterfly exhibit at the Natural History Museum. 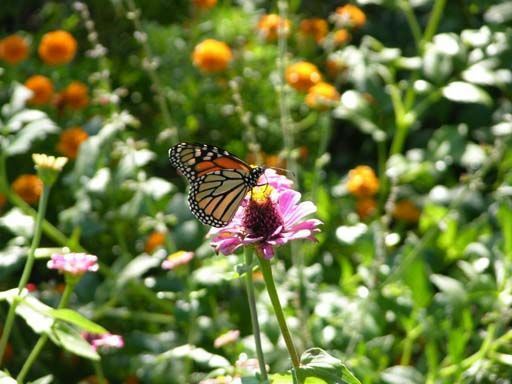 It made me a little sad that those long lines of enthralled adults and children had to go to an artificial exhibit to see butterflies up close, when every summer in my own yard I have multitudes of them flying in and out of the zinnias around my very door. 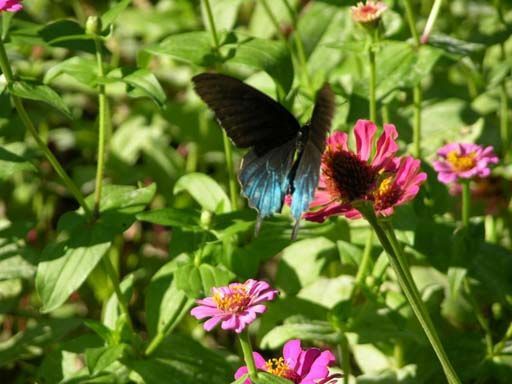 It's relatively easy to have a butterfly garden, and the beauty of it always causes visitors to exclaim in joy. 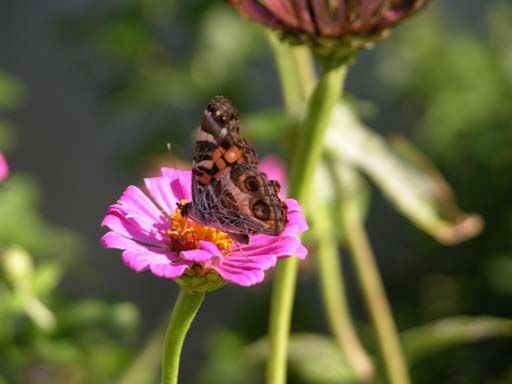 If you want to grow a butterfly garden, the first thing to do is a little research on the butterfly species that populate your bit of planet earth, and what their habitat requirements are, because different butterflies have different needs. After that, look up each species and find out what food and shelter do they prefer, and which host plants do they need to lay their eggs upon? Don't quit now because this sounds too hard and time consuming. It is really easy for there are many websites that will give you lists for your area that you can print out. Butterfly gardening has become very popular, and many nurseries stock plants that butterflies love and will populate in your very own garden. Besides flowers, butterflies need shelter and sun as they are cold blooded creatures. They like a fence or some rocks to roost upon to warm themselves in cool mornings, and they need shelter from the wind such as roosts in front of shrubs and tall grasses, or plant nectar plants around your house where they can feed in the sun and out of the wind. A shallow dish of molasses water, or fruit rinds and peelings in a spot like this will also bring you butterfly visitors. If you want a host of butterflies in your garden and not just occasional visitors, then you can grow plant species that are caterpillar food. Each butterfly species has a special few plants that their caterpillars can eat. Some caterpillars will eat a few different plants, but many eat only one kind. You will need many different plant species in your neighborhood to raise many different kinds of caterpillars. Sometimes these caterpillars will eat up your plants and you will have to decide if you want to protect the caterpillars or the plants. Some of our favorite plants are also the favorite food of caterpillars that make our most beautiful butterflies. 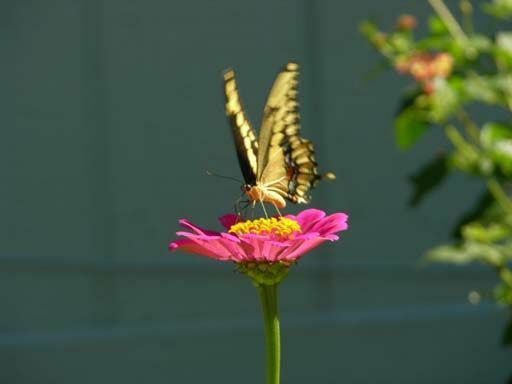 Dill, parsley, cilantro, and Queen Ann's lace are host to the Black Swallowtail. Rue is a host plant to both the Black Swallowtail and the Giant Swallowtail. Their caterpillars will actually eat it these plants down to the nubs. I try to grow enough in the garden for them and me both. You will have to raise a lot of these caterpillars, though, to get any beautiful butterflies, because the Mockingbirds and Cardinals will find them when they get fat and large, and just about when they are ready to pupate - it's a Mockingbird picnic! One favorite host plant to several beautiful butterfly species is the passion vine, or maypop vine. There are several species of passion vines, and all the Fritillary butterflies like all of them as host plants as well as the Zebra butterfly. Many of our so called 'trash' trees are host to butterflies. For instance, the Black Cherry is host to the Eastern Tiger Swallowtail, a large, gorgeous black and yellow butterfly. The thorny Hercules club is host to the Giant Swallowtail, and Netleaf Hackberry is host to four species, including the beautiful Question Mark butterfly and Tawny Emperors. Willows are host to the beautiful Viceroy. You might want to leave that trashy hedgerow in the back of the yard just for them if you like butterflies! This brings us to wild plants. Most people know that Monarchs grow on many kinds of milkweed, but Frogfruit is a common weed groundcover that both butterflies and native black bees love. It is host to several butterfly species, as well as the wild petunia (Ruellia nudiflora), Antelope-horns, and native morning glories (Convolvulaceae). You might want to not only leave that hedgerow, but allow the wild flowers and weeds to grow amongst it. You can also allow your garden to collect some leaves and debris just for butterflies to hibernate in for the winter. Butterflies are all different. Some hibernate as pupa, some as eggs, and some as adults, and some just migrate, like the Monarch. But they all need shelter if they stay - a bit of bark, a pile of dead branches or leaves, or under the eaves of your house. You don't have to have a mess around your house to do this. Just leave a little bit of leaves here and there, some firewood, or allow a little woodland area to grow if you have the acreage. This will not only encourage the butterfly population, but many more songbirds will frequent your garden for they need nesting habitat as well. 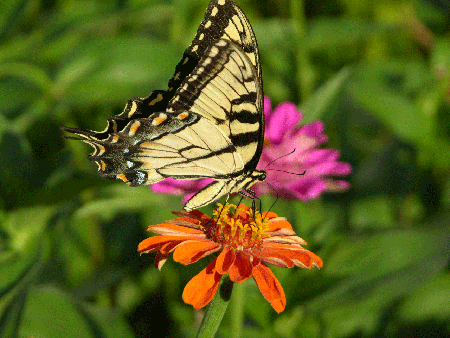 Next, plant nectar plants that butterflies love, and you will have a gorgeous butterfly garden. Most of these are drought resistant native plants such as the Purple Coneflower, Turkscap, asters, Mistflower, lantana, Mexican marigold, pentas, verbena, Butterfly Weed, Cowpen Daisy, and spiraea, just to name a few. Then don't forget to plant some zinnias. Zinnias and mistflowers seem to be a kind of butterfly candy. If you plant those you will see many kinds of butterflies in your garden, and then you can begin to learn their names and habits. For even more fun, invite people with children to your house to thrill at all the butterflies. Don't forget to have the camera ready!